Price is per 16-inch strand of about 25 beads - each measures 11mm x 7mm. Jasper is a crystalline variety of quartz that contains up to 20% foreign material. This is what determines the stones multicolor, striped, or spotted appearance. Jasper was highly valued in ancient times, not only for its beauty, but also for the reputed magical and medicinal properties. In France jasper ornaments date back two-millennia, Babylonians used in for seals twelve-hundred years ago, and in India it has been used for jewelry and building for centuries. Jasper is known as the "Patron stone of counselors and healers". Being very healing and balancing, it was used for many different medications - like grinding into a powder to treat gall bladder and kidney disease. Ancient people used jasper to relieve pain, especially childbirth. Jasper is reported to sooth the nerves and to treat the kidneys, spleen, bladder, liver and stomach. Red jasper is an intensely protective stone, stabilizing the aura and bringing contentment - even said to assist astral travel during meditation. 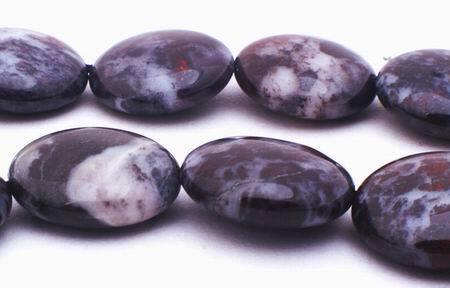 Poppy jasper is dark red with black flecks and thought to heal allergies to animals. Picture jasper is pale brown with darker patterns - named from pictures formed by patterns caused by trapped fossilizes algae. Picture jasper helps to evaluate life's issues and develop business pursuits leading to increase. Fancy jasper is creamy brown with lavender or green swirls. Believed to clear the mind, bring tranquility and eliminate worry and depression. And green jasper is thought to be lucky in monetary trades.